NEW YORK, New York, October 3, 2011 (ENS) – Distemper, a virus afflicting domestic dogs and many wildlife species, appears to be a growing threat to the Amur tigers of Siberia, Russian and U.S. wildlife veterinary scientists believe. At the first Russian symposium on wildlife diseases taking place this week in the Russian Far East city of Ussurisk, in the heart of tiger country, the team presented its evidence. Last year a tigress “Galia,” studied by Wildlife Conservation Society researchers for eight years in Sikhote-Alin Biosphere Reserve in the Russian Far East, walked into the village of Terney. “Galia displayed abnormal neurologic signs, seemingly unfazed by the new surrounding, appeared gaunt, and was searching for dogs as an easy meal,” said the scientists. After several capture attempts failed, the tiger was shot by local police. In November 2003, a similar event occurred when an otherwise healthy looking wild tigress walked into the village of Pokrovka in Khabarovski Krai. Wildlife Conservation Society staff immobilized the animal and worked with local Russian veterinarian Evgeny Slabe in treating the tiger, which later died in captivity. Samples for the diagnosis of distemper were collected only from these two animals. The samples tested positive. Health experts from Wildlife Conservation Society’s Bronx Zoo, Primorskya State Agricultural Academy, and Moscow Zoo now are collaborating to understand the role of distemper in the disappearance of Amur, or Siberian, tigers. The Siberian tiger, Panthera tigris altaica, is also known as the Amur, Manchurian, Altaic, Korean, North China or Ussuri tiger. 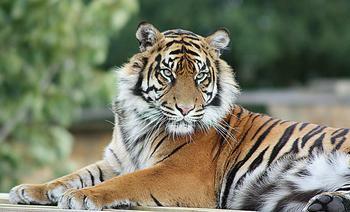 Threatened by habitat loss, fewer than 500 Siberian tigers remain in the wild. 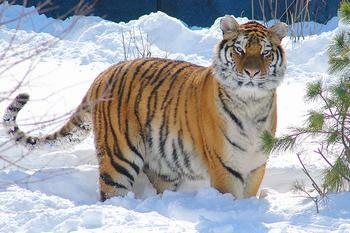 Working at WCS’s Wildlife Health Center at the Bronx Zoo, Russian and WCS scientists used histology along with DNA and PCR [polymerase chain reaction] sequencing to confirm and characterize the infection in the two wild Siberian tigers from the Russian Far East. There have been several other examples of tigers entering villages in the area or stalling traffic on major roadways in recent years, behavior that the scientists say could possibly indicate distemper. But the diagnosis announced today provides genetic confirmation of the fact that distemper is impacting wild tigers, which WCS and Russian colleagues first documented in 2003. Distemper is found worldwide in domestic dogs and has caused infection and death in wild species such as lynx and bobcats in Canada, Baikal seals in Russia, lions in the Serengeti ecosystem in Africa, and raccoons and the endangered black-footed ferret in the United States. Canine distemper in domestic dogs is controlled through vaccination. In Africa, massive vaccination campaigns of dogs in villages surrounding the Serengeti appear to have been effective in reducing the disease’s impact on lions. The scientists are still uncertain about how the Amur tigers may have contracted the disease and whether it originated in another wild animal species or domestic dogs, both of which can act as reservoirs for the infection. WCS is working with staff from the Primorskaya Agriculture Academy and other partners to establish a wildlife lab in Ussurisk to facilitate local diagnostic testing of Amur tigers, although it will take several years until the lab is funded and fully functional. In Ussurisk, the symposium participants are linking the science of wildlife health with wildlife conservation efforts. The Russian and U.S. scientists hope to use their collaboration to develop health measures that can counter this latest threat to the world’s largest cat. “With all the threats facing Siberian tigers from poaching and habitat loss, relatively little research has been done on diseases that may afflict tigers,” said Dale Miquelle, WCS Director of Russia Programs.